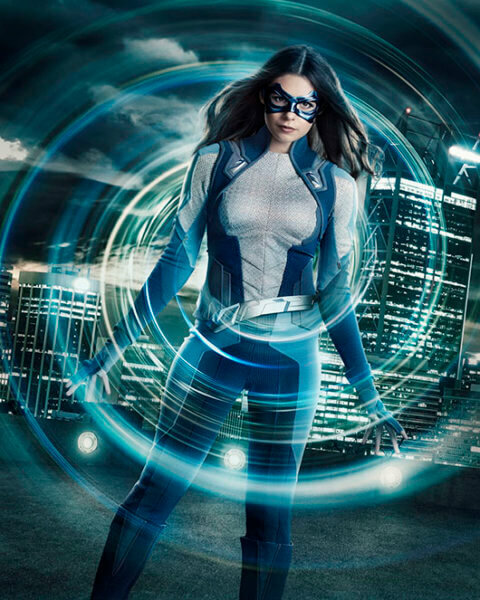 The CW’s showing off the first official photo of Nicole Maines in costume as Dreamer. Maines joined the cast of Supergirl in season four as Nia Nal, and when she suits up as Dreamer she’ll break new ground by becoming the first transgender superhero to appear on TV. According to The CW, Supergirl season four episode 11 (“Bloody Memory”) airing January 27, 2019 will reveal details on Nia’s backstory including how she obtained her powers “and what troubles come with them.” The network said that by the end of episode 11, fans will get a sneak peek at the Dreamer costume. However, Nicole in the Dreamer suit will be revealed in full in season four episode 12 titled “Menagerie.” Episode 12 is set to air on February 17th. The season four cast includes Melissa Benoist as Kara Danvers/Supergirl, Chyler Leigh as Alex Danvers, David Harewood as J’onn J’onzz, Jesse Rath as Brainy, Mehcad Brooks as James Olsen, Katie McGrath as Lena Luthor, Nicole Maines as Nia Nal/Dreamer, April Parker as Colonel Haley, and Sam Witwer as Agent Liberty. The series is executive produced by Greg Berlanti, Jessica Queller, Robert Rovner and Sarah Schecter. Season four airs on Sundays at 8pm ET/PT. KATE BURTON GUEST STARS; NIA AND KARA VISIT NIA’S HOMETOWN — Kara (Melissa Benoist) joins Nia (Nicole Maines) on a trip to Nia’s hometown to visit her family during the town’s annual Harvest Festival. While home, Nia’s mother (guest star Kate Burton) encourages her daughter to embrace her destiny. Meanwhile, Alex (Chyler Leigh) deals with a street drug that is turning people violent and giving them temporary superpowers. Shannon Kohli directed the episode written by Jessica Queller & Dana Horgan.